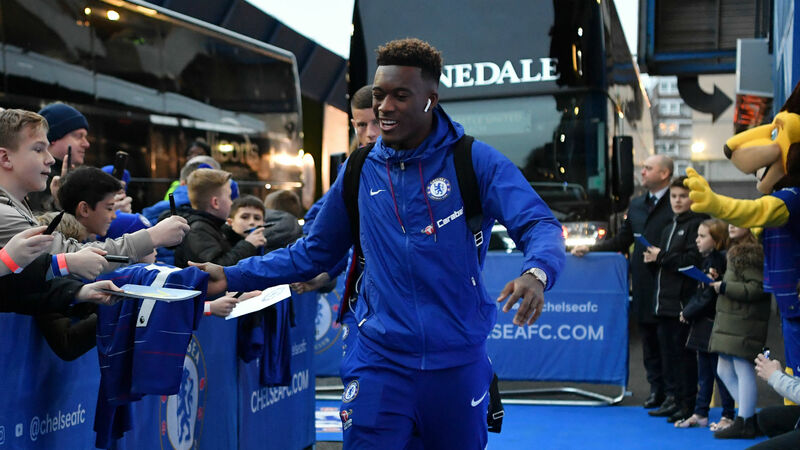 Callum Hudson-Odoi has been hailed as an "outstanding talent" by former Germany star Michael Ballack. Chelsea winger Hudson-Odoi is a transfer target for Bayern Munich, with the Bundesliga champions' sporting director Hasan Salihamidzic confirming last week that talks remain ongoing between the clubs. The 18-year-old has earned 10 first-team appearances for the Blues this season but is yet to make a Premier League start and is reportedly tempted by the prospect of greater opportunities with Bayern. "We're talking about a player who just came recently from the youth level. He's trying to achieve the step to the professional level in a top club," Ballack told Omnisport. "This makes it a lot more difficult for a young player because the standard is very, very high. It's hard to say whether the player is good enough for this demand or not. It's a fact that he's an outstanding talent. "Chelsea have to evaluate whether they want to keep him or maybe send him on loan. I think that's the philosophy of all top teams - to educate young, top players and to give them the possibility to play. "It's the most important thing during that young age, to play without losing the player. Bayern had their focus on Hudson-Odoi very early. We will see if the transfer is happening or not." Ballack was a far more established performer when he swapped Bayer Leverkusen for Bayern in 2002, having inspired Germany's run to that year's World Cup final, and he is reluctant to impart any pearls of wisdom upon Hudson-Odoi. "I don't have any advice for him. He has to see if he has a realistic chance at Chelsea in the first team or not," he said. "[Recently] he was often part of it and showed his qualities. Is it the right time to go to another top club like Bayern? Every player has to decide this on his own. There's no special recipe." The success of 18-year-old England international Jadon Sancho at Borussia Dortmund has been viewed, to a certain extent, as a motivation for Bayern's interest in signing Hudson-Odoi. Arsenal's 19-year-old forward Reiss Nelson has also impressed on loan at Hoffenheim this season and England manager Gareth Southgate welcomed the openness to such opportunities among his next generation. "I think Jadon and Reiss Nelson are the obvious ones who have trodden that path, there are some other young players who have done that and haven't yet appeared in first-team football," Southgate said, speaking courtesy of William Hill at a Football Writers Association dinner held in his honour in London on Sunday. "I think it's good that the opportunity is there. Young people now in our country are less restricted in their decision making. They don't view travelling the world in maybe the way we did when we were younger. "They're more secure in themselves and they're ready to go if it gives them an opportunity to play. For all young players, that opportunity to play first-team football is really important."